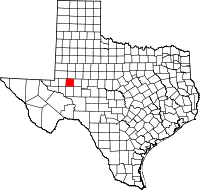 Midland County is a county located in the U.S. state of Texas. As of 2015, the population was 161,077. The county seat is Midland. The county is so named as the county is halfway (midway) between Fort Worth and El Paso on the Texas and Pacific Railway. Midland County is included in the Midland, TX Metropolitan Statistical Area as well as the Midland–Odessa Combined Statistical Area. In 1968, the county lost before the Supreme Court in Avery v. Midland County which required local districts to be nearly equal. The city of Midland had most of the county's population but only elected one of the five county commissioners, which was found to violate the Fourteenth Amendment. According to the U.S. Census Bureau, the county has a total area of 902 square miles (2,340 km2), of which 900 square miles (2,300 km2) is land and 1.8 square miles (4.7 km2) (0.2%) is water. The Spraberry Trend, the third-largest oil field in the United States by remaining reserves, underlies much of the county. As of the census of 2000, there were 116,009 people, 42,745 households, and 30,947 families residing in the county. The population density was 129 people per square mile (50/km²). There were 48,060 housing units at an average density of 53 per square mile (21/km²). The racial makeup of the county was 77.32% White, 6.98% Black or African American, 0.64% Native American, 0.93% Asian, 0.03% Pacific Islander, 12.17% from other races, and 1.92% from two or more races. 29.03% of the population were Hispanic or Latino of any race. There were 42,745 households, out of which 38.90% had children under the age of 18 living with them, 57.40% were married couples living together, 11.40% had a female householder with no husband present, and 27.60% were non-families. 24.20% of all households were made up of individuals, and 8.60% had someone living alone who was 65 years of age or older. The average household size was 2.68 and the average family size was 3.21. In the county, the population was spread out, with 30.20% under the age of 18, 8.80% from 18 to 24, 28.40% from 25 to 44, 20.90% from 45 to 64, and 11.60% who were 65 years of age or older. The median age was 34 years. For every 100 females there were 93.40 males. For every 100 females age 18 and over, there were 89.40 males. The median income for a household in the county was $39,082, and the median income for a family was $47,269. Males had a median income of $36,924 versus $24,708 for females. The per capita income for the county was $20,369. 12.90% of the population and 10.30% of families were below the poverty line. Out of the total people living in poverty, 16.20% are under the age of 18 and 7.90% are 65 or older. Although Midland was historically Democratic, it has been unabashedly Republican in presidential elections since 1952. The last Democratic presidential candidate to win the county was Harry Truman in 1948. Even in the presidential election of 1964 in which the incumbent president, Texan Democrat Lyndon B. Johnson, won a national landslide victory, it gave 57.8% of its ballots to Republican presidential candidate and Arizona native Barry Goldwater. In 2008, it cast 36,135 votes for Republican John McCain for president, which was 78% of the vote in Midland County. Democrat Barack Obama received 21% of the vote and 9,672 votes. Other candidates received 1% of the vote. Midland County is in the 11th Congressional District in Texas and it is represented by Mike Conaway, a Republican. The 11th Congressional District gave George W. Bush 78% of its votes in 2004, higher than any other congressional district in the nation. In Midland County in 2004, Republican George W. Bush received 82% of the vote in Midland County, while Democrat John Kerry received 18%. ^ a b "State & County QuickFacts". The County Information Program, Texas Association of Counties. Retrieved January 23, 2017. Wikimedia Commons has media related to Midland County, Texas.